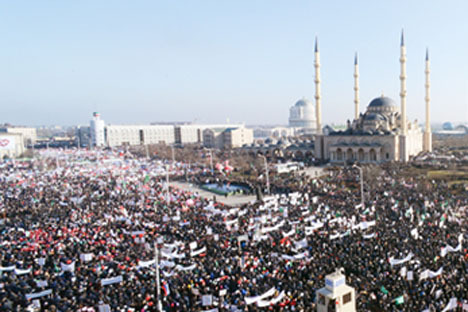 Over 1 million people have taken part in a rally protesting the cartoons of Prophet Muhammad, General Ruslan Alkhanov, Russian interior affairs minister for the Chechen Republic, told Interfax on Monday. All central squares and avenues were full of people and people marched into the center of the city after the rally began. Among the protesters were people from the neighboring regions, from Moscow and from abroad. Among the people who spoke at the rally was Sheikh Ali Jifri, a descendant of Prophet Muhammad. He condemned the cartoonists' actions and reiterated that they were caused by their ignorance and lack of knowledge of the foundations of Islam. Bishop Varlaam also strongly criticized the cartoonists, reiterating that "the entire Russian Orthodox Church categorically denies these cartoons." We strongly condemn the evil that they are trying to spread between our religious. It's never going to happen," he said. The republic's Interior Ministry told Interfax no incidents were registered at the rally. The press center for the Russian Interior Ministry earlier told Interfax the rally had over 800,000 participants.